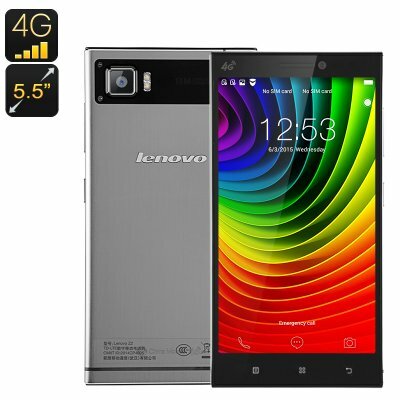 Successfully Added Lenovo Vibe Z2 Smartphone - 64Bit CPU, 2GB RAM, 4G, 5.5 Inch FHD Display, 13MP Camera, Dual SIM (Black) to your Shopping Cart. With a 64 bit Snapdragon CPU and 2GB of RAM the Lenovo Vibe Z2 Smartphone has a smooth performance to match its sweet looks. The slim brushed aluminum unibody really makes the phone stand out from the crowd and with its fine craftsmanship you won't want to hide this lovely phone in a case. This Smartphone is up to handling all your apps and games seamlessly and they are certain look great on the 5.5 inch HD display thanks to pin sharp quality and a rich color gamut. For the fastest data connectivity around this Lenovo phone comes with 4G connectivity on both of its Micro SIM card slots. This ensures that you will have quick downloads and web access for streaming media, downloading apps or surfing the web. On the rear of this Android phone is an impressive 13MP camera which thanks to its remarkably sensitive sensor can snap high quality images in low light. The front facing 8MP camera is perfect for capturing selfies while shooting video on the phone can be done at full HD resolutions. A large 3000mAh battery allows for around 14 hours of talk time and can easily be recharged in 3 hours or so. This means you'll have a full days worth of usage from every charge and all but eliminates running out of power throughout the day.